DesignGreen was voted to receive the contract for an Engineered Design of RMA's Dupont Tree Plaza by the Restore Mass Ave Board of Directors Oct 23nd, following a three-way bake-off. The three valid proposals were read and scored by two outside professional Reviewers. RMA Board members compared each proposal against the requirements in our RFP released September 25th. It was close! One Reviewer said all three showed "depth of experience" with designing and getting the myriad permits required to install "storm water retrofits" in District public space. Five of the seven firms who had attended RMA's onsite briefing Oct 10th then bid on the project as leaders or team members. "The high participation rate shows a lot of enthusiasm in the DC storm water/urban design industry for our plaza project," says the President of RMA Deborah Shapley. The RMA Board and Reviewers want the runners-up to know how much we appreciate their input, RMA hopes to work with them in other ways. The runners-up were Greening Urban / Moody Graham and Sudio39 / Bohler. Wooden drew the future tree rows from the site plan below. The DesignGreen proposal was specific as to how each task in the RFP would be done, by whom and when. This meant a higher score on Method and Comprehensiveness because the two others did not spell this out so clearly. The Board found that DG's partner Huska Engineering, which will take the lead from the 65% plan on, also appropriate for this project. The DG proposal focused more than the others on the innovative aspect of planting and growing large-type trees The team includes a specialist in this, Melissa Gildea of Lotus. The proposed investigation of soils was important The site's soils are unknown yet the roots large-species trees will need the right soil. The DG proposal warned that boring in the Discovery phase could turn up constraints. Our Reviewers echoed that unexpected hurdles appear in such projects. David Wooden Studio submitted graphics showing the site. Runners-up had great recent projects; both are qualified to do storm water retrofits in DC. Each lost points for not spelling out clearly the steps requested in our RFP. We also looked for team leaders who are running complex,small projects.
. The outside Reviewers knew all three proposers and many of the team partners. Lesley Conroy PLA Associate, GGN Ltd.
Heartfelt thanks to everyone who considered this project, especially those who submitted. The Board want sall who submitted to get friendly feedback from us. We may be able to engage some who didn't get this award on other projects in future. 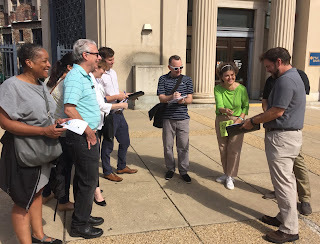 Finally we thank again the Chesapeake Bay Trust G3 (Green Streets, Green Jobs, Green Town) fund for making it possible for RMA to commission a permit-ready Engineered Design for the Dupont Tree Plaza. 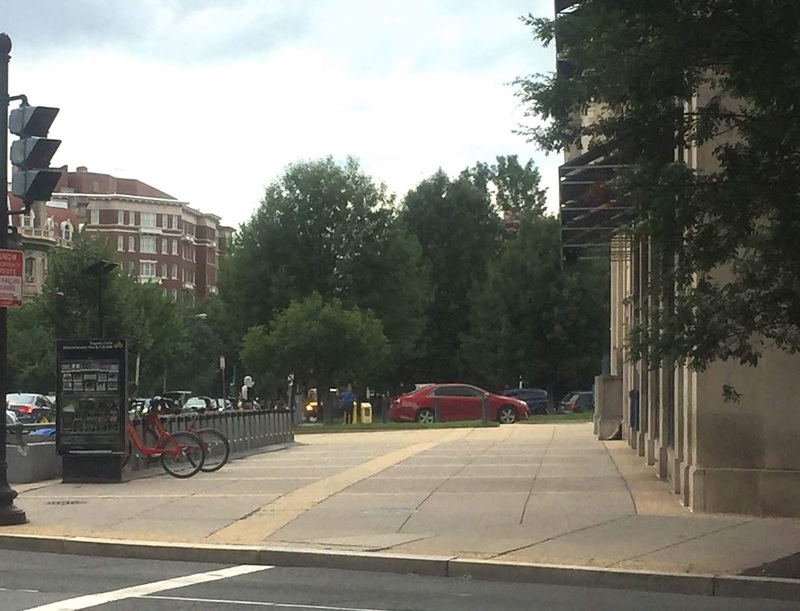 Restore Mass Ave seeks bids from qualified firms to make an Engineered Design for a Stormwater Retrofit in the bare sidewalk by PNC Bank at Dupont Circle. The RFP and more detail is at RestoreMassAve.org/dupont-tree-plaza/ Instructions for filing are in the RFP. 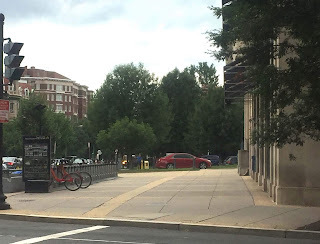 The Dupont Tree Plaza would add 11 trees to the city sidewalk, for 14 trees in all. It will collect stormwater runoff, clean the air and calm traffic. 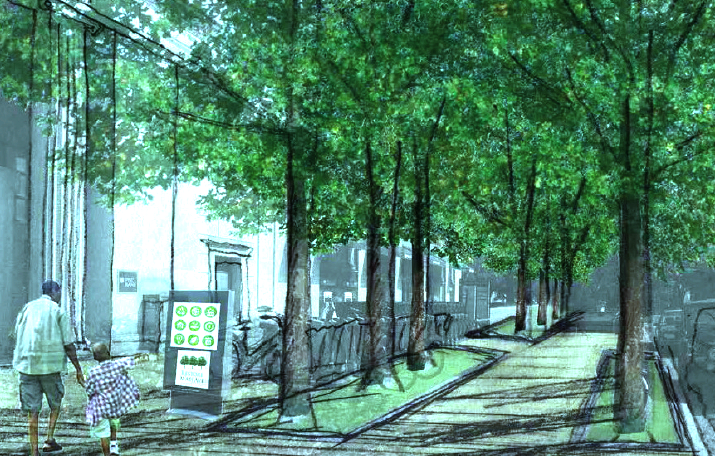 It would help birds and other wildlife move from the tall, leafy trees of Dupont Circle to the shade trees RMA is growing in rows, marching west from 20th Street along Embassy Row. The Plaza will be a new community space: pleasant to pass through, nicely lit, and having an info kiosk for locals and visitors to learn about this unique neighborhood. The Chesapeake Bay Trust has honored RMA with a Green Streets, Green Jobs, Green Towns (G3) grant funded by the EPA, to have this permit-ready Engineered Design created. We are excited to receive your submissions by 4 pm Wednesday! 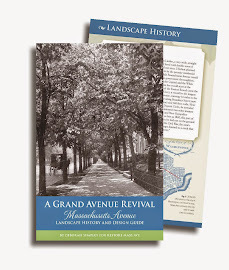 Restore Mass Ave - "Friends working together to re-green Embassy Row"
Anyone interested in bidding on the Engineered Design for our Tree Plaza, who has questions, should submit them by 6 pm Thursday Oct 11 to RestoreMassAve@gmail.com. Please say "Dupont Tree Plaza Design" in the subject line. If there are any Addenda to our Sept 25 Request For Proposals, we will post by midnight, Friday Oct 12, on the Dupont Tree Plaza page. Links to this page are our Home Page and this Blog. Note: The Site Plan pop-up on the Tree Plaza page has dimensions. Seven firms attended today's Site Meeting to learn more the project and site detail. Attendance at this meeting was recommended not mandatory. See the RFP for full schedule and instructions. We'll keep working so that, soon, the hot sidewalk above will be shady and cool, based on a wonderful new design. Bidding is under way for an engineered design of Dupont Tree Plaza! We invite interested bidders to come to the site for a pre-proposal meeting Wed. Oct. 10 from noon - 1 pm. Meet us on the sidewalk in front of PNC Bank, shown below and on our Tree Plaza page. Site of future Tree Plaza. Address: 1913 Massachusetts Ave NW. We'll show the site detail and issues with this space. We'll explain what city agencies and private groups who support the plan - such as Farmer's Market and PNC Bank - have said. Deadlines for questions, etc, are in the RFP you may download here. No addenda will be issued after Friday Oct 12. The Proposal Deadline is 4 pm on Wed Oct 17. Bidders will propose how they'd make a permit-ready design that transforms this prominent but neglected city sidewalk into a shady community space. 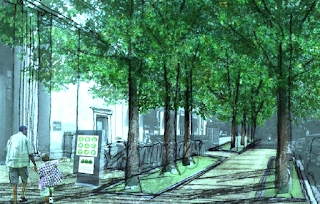 The design should accommodate the bike stands, pleasant pedestrian walking and eleven new trees. Below ground, the retrofit will collect stormwater from Connecticut and Massachusetts Avenues. The Plaza can have other cool features such as a neighborhood kiosk. This RMA Award will be funded through Chesapeake Bay Trust's Green Cities, Green Jobs, Green Towns program. Since 2011, this regional effort has awarded $8.5 million to 145 projects. Restore Mass Ave is proud to be one of just two stormwater projects in downtown DC earning G3 awards. The Awardee will be part of CBT's network of groups cleaning the watershed. The G3 program aims to promote community liveability and future green jobs. The Awardee will be expected to share their work with local public school students, so youngsters learn how to make old downtowns "green."